Let’s take a look at some of the things you should remember when choosing where to place your online store in 2019. If you run a business of any kind, the chances are that you want to not only market your work online, but also have a way of reaching customers and selling it. This is where online store platforms come in. There are many different kinds, but what they all offer you is the chance to sell directly, and to have a professional-looking online store that will operate slickly. Software-based platform or service-based platform? It’s worth looking at the differences between different platforms. There are two main kinds of ecommerce platform, software-based platforms and service-based platforms. These differ in several key ways, which will probably determine which one you opt for. Software-based ecommerce or online store platforms are designed to be flexible. 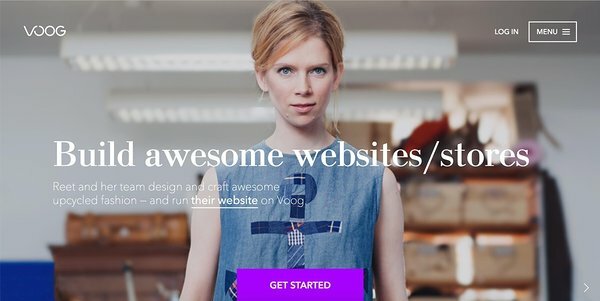 Many of them are open-source or free, and this may initially seem appealing, but be aware that you will need to sort out domain, hosting, site design, acceptance of payment methods, and all the fundamentals yourself — software-based platforms instead have the virtues of being endlessly expandable, meaning that you can run a major online store using one of these solutions. The downside is that you pay for this flexibility by having to devote more of your company’s time to hosting the store, updating the software, and ensuring it works well with your existing website. Most software-based solutions work with WordPress. All software-based ecommerce solutions offer custom products that are priced depending on specific needs. Unlimited Shopify Payments – 0%. Magento and Woocommerce both run on WordPress if required to, or whichever custom site has been developed by a third party for a large company. With a software-based solution, it is possible to create something complex, with multiple departments and rooms for all of a company’s products. With all that said, there is a problem — it may prove too complex for all but experienced coders to handle on a long-term basis, so this is something to think about. Solopreneurs may find this fact prohibitive, as it will add extra labour to an already packed schedule, and may benefit from the hiring of a web team to dedicate further time to it. A major enterprise which needs a large website working hard for it every day will require this kind of service, but smaller businesses may not. Magento is now part of Adobe, the company best known for pioneering the PDF document. 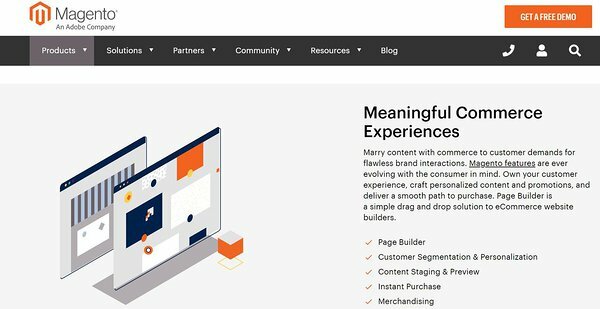 Magento is a respected name when it comes to building large-scale online stores, and promises a flawless customer experience, including contacts, instant purchase (similar to Amazon’s One-Click Ordering) and the ability to produce personalised content to suit the business and its customers. The ecommerce platform designed specifically for WordPress, Woocommerce is great for businesses using the world’s most ubiquitous website builder as the underpinnings for their online presence. As it’s designed with only one platform in mind, you’ve got the advantage of a highly intuitive interface, and the near impossibility of any incompatibility issues. You’ve got, here, a plugin that works. Woocommerce also fits in with Zapier, SagePay, Amazon Pay, and a whole host of other payment service providers that are increasingly popular with ecommerce sites, and it’s this inherent flexibility that makes it so well-liked by businesses and website managers alike. If there is a potential drawback, it’s that Woocommerce, as an open-source product, needs time and attention to get looking and working as the user wants, and this can be an issue for time-poor small business owners. Making sure the shopping cart works with your site can be labour-intensive, as can, if you’ve not used it before, getting your head around WordPress. Used by many leading global companies, VTEX promises a tailored solution to the specific needs of the store operator. Its straight-up pricing model, with, it promises, no hidden fees, is a boon for anyone who has had to search the small print for these kinds of things before now. However, with the most basic packages starting at USD 500 per month, this is not a beginner’s online store. In addition, although we have listed it among software-based solutions as it is a flexible and heavy-duty option, in fact it operates on the SAAS (software as a service) model, and as such is not a pure software solution that you will gain full control over. The other kind of online store platform is the service-based platform. This entails using a pre-made, hosted, program that can hold all of your products, which also handles payments using its own interface. What’s great about these kinds of solutions is they provide the user with less of a headache than something that has to be set up from scratch with a team of developers. Put simply, a service-based online store is something that most people can run on their own, or in a small team, with no need for a specialist website manager or IT person. With hosting and support already taken care-of by the provider, it means that small and medium-sized enterprises can focus on creating and marketing their work, without worrying about the point-of-sale side of things. Issues can be ironed out by support teams who are usually trained to work with people who are perhaps tech-savvy, but who do not necessarily possess in-depth programming knowledge. One of the market leaders for online store platforms, Shopify has got where it is through the kind of initial setup tips that can guide any user through its menu options, and a user interface that is unthreatening, streamlined, and stress-free. The product is essentially a whole online store website through Shopify’s one-stop solution. The company also has its own payment solution, although you can pay a monthly fee to use alternatives if wished. Excellent and friendly customer support, available 24/7, means that if an unlikely crisis at your store should occur, it can be sorted out right away. Although Shopify works off a number of templates that are limited (relative to software-based solutions) in their capability, there is still enough customisability that a user can take what is offered and make it look like the rest of their brand. 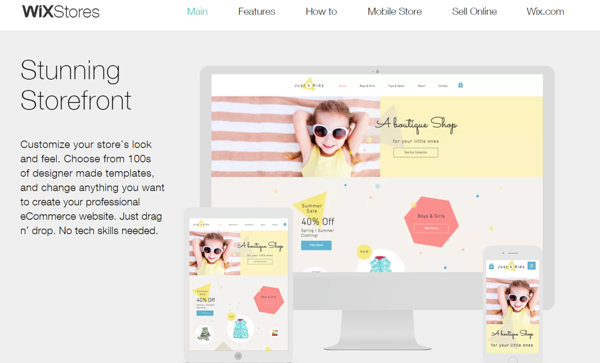 One of the things Wix prides itself on is that anyone can use its drag-and-drop interface to create an ecommerce website in a short space of time. They have hundreds of templates to choose from, and although the results, depending on your payment plan and the size of your product line, can be limited, it might be that what is on offer is right for what you need. It’s important to think about your business, and how far you want to grow it, before committing to Wix, but if what you want is a simple solution that one person can set up on their own with limited skill, this may be right for you. 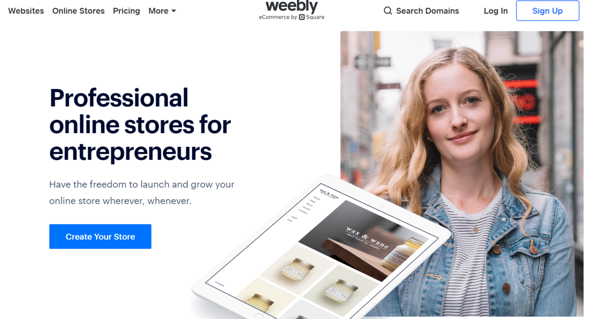 A bit like Wix, Weebly promises a drag-and-drop solution that requires limited time and labour to get right, and so is great for the busy entrepreneur. The templates on offer vary a little, and Weebly also offers a highly-rated mobile interface, important in these days of ‘mobile-first’ browsing, when more internet users are on some form of touchscreen device than are on a desktop or laptop computer. Where you might run into difficulties with Weebly is with the lack of a free multilingual website-building aid within its product. This means there is no native way of instantly creating pages for your site in a variety of languages; instead, you’ll need to do a bit of manual heavy lifting, which might prove a problem for small businesses wishing to go global. If you watch YouTube video essays, you’re probably keenly aware of Squarespace, such is the company’s dominance of advertising on the platform among a certain kind of content creator. It’s no coincidence this is the case — the majority of creators would not take sponsorship without liking the product, and Squarespace’s online store interface, like everything else it produces, is beautiful to look at. Recent updates to the user interface have made Squarespace a lot easier to use on old or slow computers, but be aware that if you are building too much into your Squarespace site, you may experience a certain amount of lag, or even have to reload the site’s webpage completely. With all that said, Squarespace’s templates, along with its support of a wide variety of payment methods and 24/7 help, make for an incredibly flexible drag-and-drop website builder. 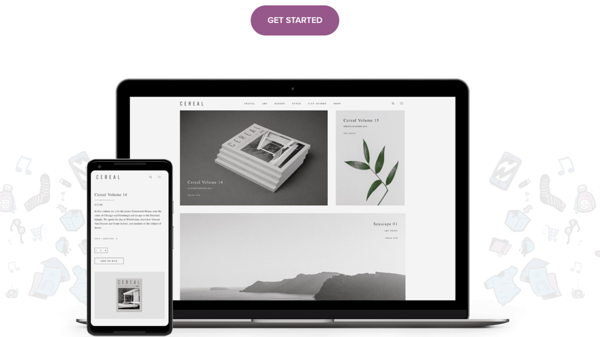 The problem is in the amount of options on offer, which, for a first-time website creator, might seem a bit baffling, and rare is the time when a novice can get their Squarespace template to look as gorgeous as the demo version does. If you’ve been reading this blog for a while, you’re probably aware of Voog’s unique multilingual support — if not, you may find that it is essential in order to truly grow your business. Depending on what you sell, and where you want to sell it, a multilingual online store can be an essential thing. Of course, not everyone wants to compete with Amazon or Alibaba, but still, it helps to be able to get the maximum out of your business, and the reality is, particularly in diverse markets, not everyone speaks or reads English. You can read more here about how our multilingual website builder works in practice, but it’s not the only good thing about using Voog. You’ve also got templates designed with a great look in mind, but also an intuitive user interface, and our controls mean that you’ll get help in deciding not only what looks cool when a visitor sees it, but also what you need a visitor to see, and when a lot of features might be too many. What’s more, Voog can offer committed, 24/7 support from a team of people in our office in Tartu, Estonia, who know the product inside out — something our users love. Monthly packages are geared to all pockets and all kinds of businesses, so that, for as little as €6 per month, you can be running an online store that impresses everyone who visits it.